Welcome to Board Watch for the Weds 2/15 Meeting! In celebration of Black History month, the standing-room-only audience at DeJean middle school kicked off this week’s meeting by watching the Hercules High School dance troupe perform. Next, two student groups from Verde Elementary performed tributes to Maya Angelou’s “Still I Rise” and Stevie Wonder’s musical legacy. Much of the remainder of the meeting was dedicated to discussion and voting on 3 charter school organizations’ petitions – Richmond Charter Academy’s 5-year renewal petition, Voices Language Academy’s new TK-8 Charter Petition and Caliber: Beta Academy’s request for adequate facilities under Prop 39. In addition, the board voted on the location of a new Chinese dual-language we heard from both the board and UTR on their initial bargaining negotiations. To see the full meeting agenda, click here. 13 speakers stood up in public comment to share their perspectives both in favor of RCA’s renewal and against it. 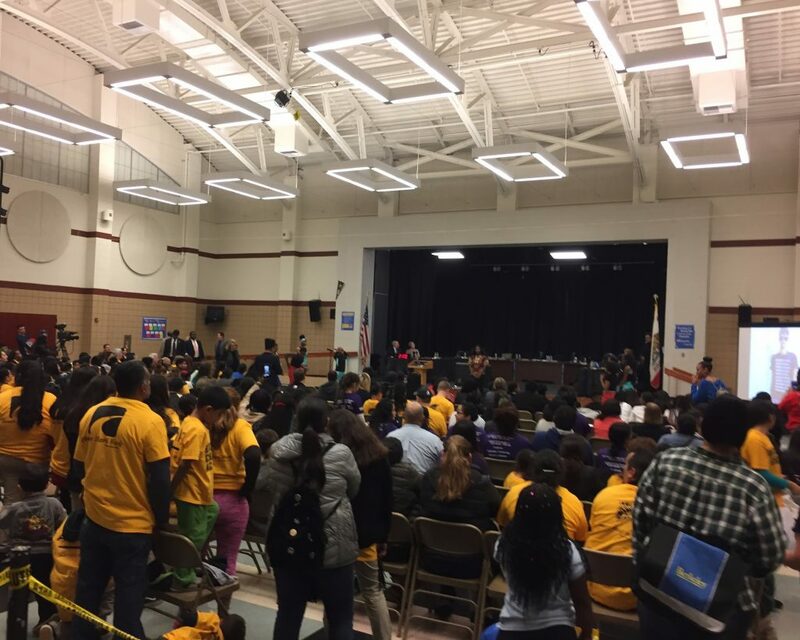 The crowd was notably filled with bright yellow t-shirts worn by Richmond Charter Academy parents, students, teachers and supporters who cheered on their school’s representatives as they presented. After public comment, board members conducted a lengthy discussion about the school’s approach to discipline – and the steps RCA will take to amend its petition to address concerns A-I above in the coming year – before calling the renewal to a yes or no vote. The board unanimously voted to grant RCA’s charter renewal for 5 more years. A new charter petition, from Voices College-bound Language Academies, came before the board and public hearing during the 2/15 meeting. Since there would be a long ramp-up to the charter’s proposed launch in the district (2018-19 school year), this hearing was preliminary. Board members focused their questions for the Voices leadership on a) steps the charter would take to establish racial parity in their proposed Richmond school with the district’s demographic balance, b) ongoing parent engagement at Voices’ existing Santa Clara county schools, and c) LCAP accountability measures. Voting on the petition will take place in a future meeting. Stay tuned to Board Watch as your local hub for updates on this item! To see the full Voices presentation, click here. Though not formally on the agenda, a large group from Caliber: Beta Academy spoke during public comment about a needed upgrade of their facilities from portables in Kennedy High School’s parking lot to a permanent facility. Speakers cited safety concerns, inadequate play spaces, flooding, unnatural lighting and – notably – Proposition 39 in their comments. Prop 39, introduced and voted into Education Code in 2000, states that “facilities should be shared fairly among all public school pupils, including those in charter schools” (www.cde.ca.gov). As this item was not on the formal meeting agenda (and therefore did not face a vote on 2/15), Board Watch will keep you informed of progress in coming posts. Stay tuned! A new Mandarin language-focused school will be opening in WCCUSD for the 2017-18 school year with three Kindergarten classes. District Staff recommend that the board approve the school to be located at the Serra site at 6028 Ralston Avenue in Richmond. During public comment, representatives from the community urged the board to approve the Serra site (currently an adult education site being considered for consolidation) for the new school, arguing that housing the school at Serra as a standalone school would attract families to the district in a time when enrollment continues to decline. To back this claim, representatives cited enrollment patterns at Mandarin Immersion programs in nearby communities, such as at Fremont Unified School District. After board discussion, the motion carried unanimously to house the site at Serra. Running late at the end of this week’s meeting, the board voted on initial bargaining proposals for both UTR and the district. In annual contract negotiations, each party is permitted to negotiate one part of the certificated staff contract. UTR chose to negotiate salary while the district chose to negotiate the school calendar. Both initial bargaining proposals passed.